1. What school district is your build site located in? What schools are available (K-5, junior high, high school)? Are there both public and private schools available? How competitive is the school district? Has it won any academic awards for excellence? Are the schools crowded? Do they have a good student to teacher ratio? How does transportation work? Is your build site close enough to walk, or will your kids need to take the bus? You’ll spend many hours helping with homework, cheering at sporting events, or attending band concerts, so get to know your schools before building your home. 2. Is the community safe? Is it quiet at night, or are there a lot of loud parties? What are the most common reported crimes in the surrounding area? Do people maintain their properties, or are there lots of homes in disrepair? Are the streets in the community well lit at night? You want to live in a community where you feel safe walking the dog in the evening. Remember that property value is affected by the surrounding neighborhood – select a build site that has a solid record of quiet safety. 3. Is there convenient shopping around? Where will you go for groceries? No one wants to battle traffic for a gallon of milk and a dozen eggs. Where are convenience stores, gas stations, dry cleaners, and car washes located? Where is the nearest shopping mall, if you need clothes or want a relaxing day of browsing? Considering your home’s proximity to these basic amenities will help you understand how your daily life may flow, and how much time you’ll need to spend in a car to get to the places you need to visit. 4. What nearby opportunities are there for recreation & exercise? Are there parks for hiking, exploring, and relaxing? Do any local organizations hold concerts or fairs in the park? Are there popular biking or hiking trails nearby? How close is the nearest gym or pool? Is the site close to regional attractions like zoos, waterparks, concert venues, or museums? What are the dining options? Are there good neighborhood bars or coffee shops or cafes within easy driving (or better yet, walking!) distance? 5. How do people in the community relate to each other? Are there opportunities for civic engagement? Is there a governing commission or a neighborhood association, and how do you get involved? What about community support groups like crime watches, parent groups, or carpools? Are there volunteering opportunities nearby? Asking questions about civic groups will help you learn how close-knit the community is – and if there are opportunities for you to get involved and develop friendships with your new neighbors. 6. What are the property taxes and housing fees like? Is there a Housing Association that you’ll be required to join? Are there zoning restrictions or community by-laws that will affect your build plan? What are the taxes like for the city your build site is located in? When do you pay those taxes? While certainly not exhaustive, this list is intended to be a good start to help you become familiar with the prospective location for your home. When you’re searching for a future home site, don’t just evaluate the build site itself – evaluate the surrounding community! Doing so will help you build in a great location that your growing family will continue to love for years and years! 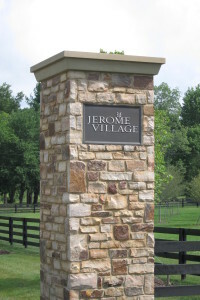 If you’re looking to build a new home in Central Ohio, be sure to check out our featured communities!